The reveal of Minecraft: Story Mode was met with a lot of internet skepticism in 2014—could a narrative-driven take even work for such an open-ended exploration game? I’ve played through the first episode of the new series, and can say with confidence that yes, actually, a story fits Minecraft pretty damn well. 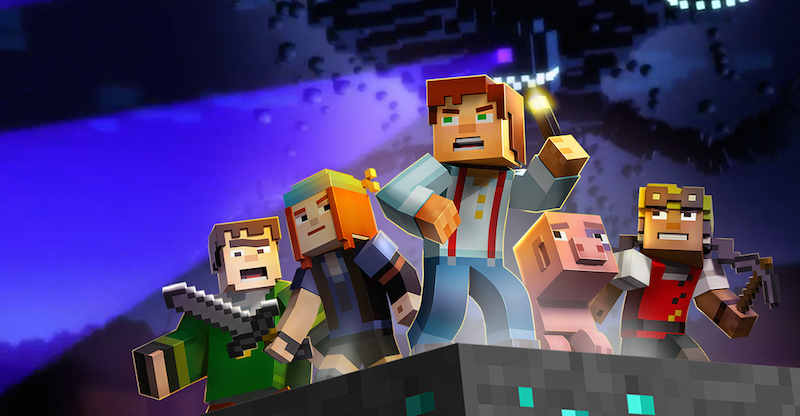 Minecraft: Story Mode is an adventure game made by Telltale—but it’s not like recent Telltale games, at least in terms of tone. You won’t find a dark, gritty storyline that asks you to make impossible choices, as you would in The Walking Dead. Nor does it explore the complicated, cutthroat politics that make Game of Thrones. Minecraft: Story Mode is a very happy-go-lucky game that seems aimed kids, families, or Minecraft fans. Boy or girl, you will be known as “Jesse,” an optimistic kid with a ragtag group of friends. Your biggest worry in life is that your peers think you are a loser. So, you hatch a plan. You and your friends set out to create something cool for a competition held at a convention known as “Endercon.” The hope is that in doing so, you’ll gain some respect. That’s the sort of world Minecraft: Story Mode creates: everyone builds things here, and even the dopiest of your friends can talk shop about crafting recipes. Minecraft can also be a pretty hostile game, though. Fittingly, people who brave the terrors of the night are known as badasses. Some of these heroes even go down in history as legends. This being a video game, it’s not long before you meet these fabled heroes—which then gives you an opportunity to prove yourself, too. The game is all about how the most unlikely of people can be courageous in times of need. It’s not particularly novel, but Minecraft: Story Mode pulls the theme off just fine. Minecraft: Story Mode works like recent Telltale adventures: most of the game involves talking to people, or making quick decisions before time runs out. Sometimes, you’ll get a few QTEs that liven things up here and there. Mostly, though, it felt like I spent most of my time making quips with my buddies—Story Mode is a charming game with a big sense of humor. My favorite moment was one where my group of friends watched as the cool kids did a secret handshake. We wanted to look cool, too. We decided to make a secret handshake then and there, just to show off. Fumbling and unsure, I came up with something completely random and lame. In a twist that pokes fun at Telltale games, the game told me that nobody would remember that. Aww. What really makes Story Mode, though, is the way it embraces everything that makes Minecraft, well, Minecraft. This goes beyond the visuals, which you’ll note look exactly like Minecraft. It’s in the smaller details, too. You dress your pet Pig as an Ender Dragon. There’s a montage where you punch trees. Lava almost ruins everything. You’ll need to build a shelter to survive the night. You’ll fight creepers. Sometimes, you’ll get a chance to craft stuff—but if you take too long, your friends tease you for being a noob. I’ve only dabbled with Minecraft before, but even so, I appreciated how Story Mode manages to stick to the source material in smart, funny ways. I only have two “major” complaints. One, every character seems to perpetually do that sort of creepy Dreamworks smirk, which proved unsettling in an unintended way. And two, the episode ends when things actually gets real. It’s a good set-up for a cliffhanger, sure, but the episode is short enough that it almost felt like it ended right when things got really good. Guess I’ll have to come back for episode two, eh? Playing it, what strikes me the most about Story Mode is how much a narrative-driven take on Minecraft makes sense. Forget the internet wisecracks. The bigger picture is this: people are already using Minecraft to tell stories—just look at YouTube. Most book stores even carry entire sections devoted just to Minecraft. If anything, the biggest surprise about Minecraft: Story mode is that it took this long for something like it to exist.